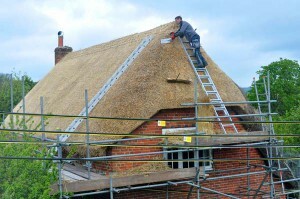 Often a roof will need one or more coats to be stripped off before the thatching process can start. This is to prevent too much weight being placed upon the roof structure and to gain an even under-coat. 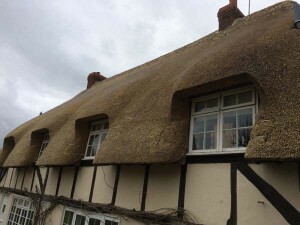 Once this process is complete the new materials can be added, secured in place with new traditional hazelwood spars and thatched to the correct pitch. The property will then be finished in new galvanized netting, this is to prevent rodent and bird damage. 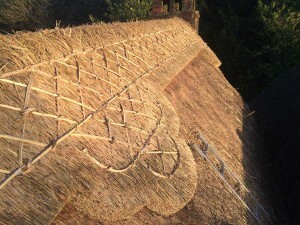 The main purpose of the ridge is to seal the apex and prevent water damage to the thatch. Replacing the ridge at the right time can prolong the life of the whole roof and in some cases prevent the need for an early re-thatch. The style of the ridge can be dependent upon material, local tradition and customer choice. 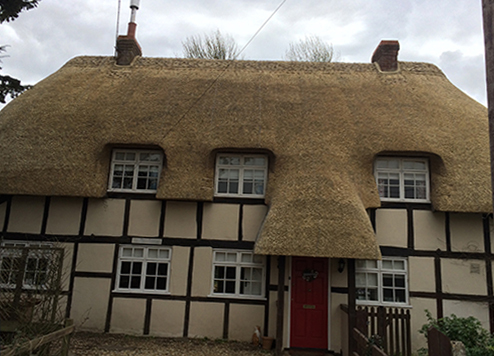 Listed thatched buildings require listed building consent to change from one ridge type to another. These ridges, as described are flush with the main coat work and are decorated with a spar pattern. 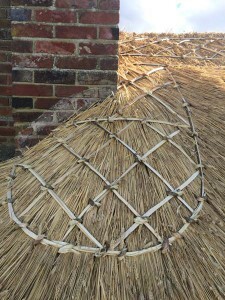 A block ridge is where a block of thatch is put on top of the roof, this maybe a straight cut, or patterned (ornamental) Ornamental can be scallops, diamonds or anything of your choice. 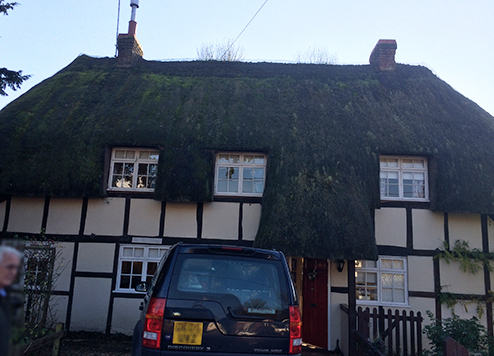 If you are unfortunate to find a leak from your thatch, don’t panic, you may not require a total re-thatch. In some cases it is possible that a repair to the damaged section could be carried out. A repair will always be done in the same material as the coat work and is held in places with spars and/or screws. 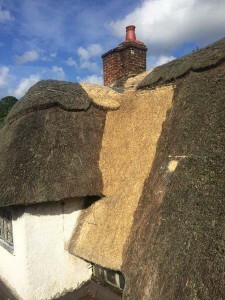 When re-thatching any property an inspection of the pointing, both above and below the thatch line is vital to ensure that the chimney structure is safe and does not pose a fire hazard. 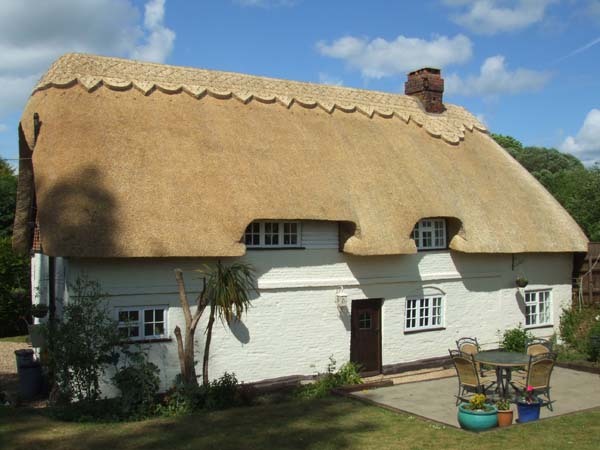 Building regulations state that any chimney on a thatched cottage should be 1.8m above the thatch; this is to allow any sparks or embers to die out before exiting the chimney or be directed away from the thatch. It is advised that your chimneys should be swept at least once a year, or more frequently if wood is burnt. 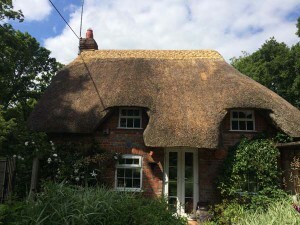 I always ensure the surrounding areas of your home are kept tidy throughout the thatching process, removing old thatch from site and have a thorough tidy up upon completion of the job.